This last week had me thinking a lot about what I want to accomplish before summertime arrives and our schedule changes a bit (yes, even homeschoolers without an enormous amount of extracurriculars end up having a different summer schedule!). Resolutions shouldn't only be made in January, right? Right. So, I decided it might be nice to get a handful of specific goals written down for each season, to help guide my focus and hold me a bit more accountable. 1. 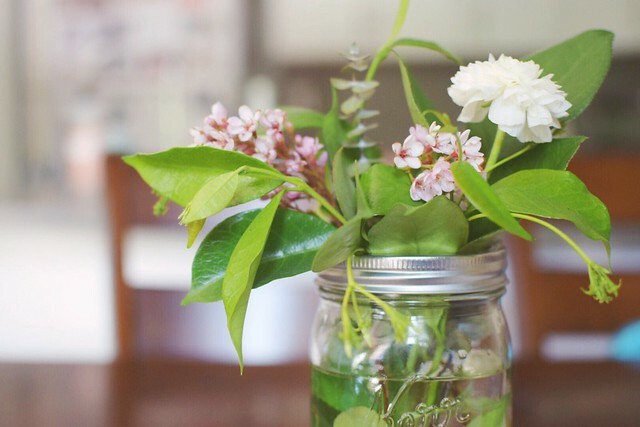 Always have fresh flowers on the table. My mom was in town for a visit last month, and she bought me flowers that came in a mason jar, and it pretty much made my life complete. I never, ever buy flowers (and my husband is a gem of a man, but he has bought me flowers like five times in our entire marriage). I realized after I had that bouquet on our table for a solid month (I would pick out flowers as they died, but the thing held on for a remarkable amount of time) that something as simple as flowers on the table did wonders for my mood. Isn't that weird? It would legitimately make me happy every time I saw it. So, my goal now is to always have flowers on the table, even when it's an awkward mishmash of clippings from our front porch, as seen above. 2. Continue building relationships with our neighbors. Even though we've lived here over a year, it hasn't been until recently that we've been able to socialize a bit more with some of the people who live in our community. The girls play outside every afternoon, so I have started having regular visits with several of our neighbors while the girls run around with new friends. We've never really gotten to know our neighbors well at any of the other places we've lived (apparently that's fairly common here in Southern California) and it has felt good to feel a sense of community with the people around us. I must confess: I'm awful at being the person who initiates conversations (introvert problems) but I find that I'm always so grateful for them when they actually happen. 4. Start waking up early (almost) every morning. Verity continues to be a sleep champion/magic baby, and I'm more rested now that I've been in ages. I'm a mere shadow of the woman I once was. (In a good way.) I actually find myself staying up until 10PM without having a borderline panic attack about how little sleep I'm going to get. (Hallelujah and good night.) I'd love to start waking up before the girls again, the way I did a couple years ago, because even having twenty minutes of time to myself before the day truly begins does wonders for my overall attitude and mindset. I don't want to be overly ambitious and plan morning workouts and devotions and blog writing and planning-the-day and being dressed and ready before the older girls are up. (Sometimes when I start a new routine I need to take a chill pill. True story.) But I'd like to at least plan on having a cup of coffee to myself, in addition to one other thing—even if that one thing is finishing a couple chapters of my current read. Here's to new (and hopefully achievable) goals!